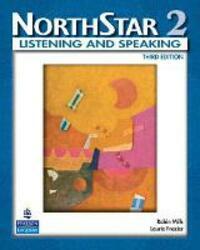 Northstar, now in a new edition, motivates students to succeed in their academic as well as personal language goals. For each of the five levels, the two strands - Reading and Writing and Listening and Speaking - provide a fully integrated approach for students and teachers. What is Special about the New Edition? New Themes and Updated Content - presented in a variety of genres and in authentic materials - challenge and engage students intellectually. Enhanced Focus on Academic Skills, more purposeful integration of critical thinking, and an enhanced focus on academic skills such as inferencing, synthesizing, notetaking, and test taking help students develop strategies for success in the classroom and on standardized tests. A structured approach gives students opportunities for more extended and creative oral practice, for example, presentations, simulations, debates, speeches, public service announcements and more. A New Design with full color pages, more photos, illustrations, and graphic organizers fosters student engagement and makes the content come alive. MyNorthStarLab, the easy-to-use online companion of the NorthStar series, saves time and improves student results. Saves Time With automatically graded exercises for every unit of each book, instructors no longer have to create or grade homework. This gives them more time to prepare classroom lessons. Instructors can choose exercises and set due dates with just a few clicks. Homework for an entire semester can be set up in less than an hour. Improves Results Students have more opportunities to practice English in more ways - from video exercises and audio discussion boards to vocabulary games and academic practice. These new exercises help students learn more English, more quickly. Immediate feedback on their performance allows students to come to class better prepared. If students do not pass a section of a unit test, they automatically receive new exercises targeting areas that need improvement. The MyNorthStarLab Access Code card is also available on its own, without the Student Book.